Jurgen Klopp’s first three games as Liverpool manager gave us just as much gegenpressing, high work-rate, and press conference comedy as we expected. The only real surprise from these three matches was that he still hadn’t earned his first win. This was rectified on Wednesday night as Liverpool beat an ever impressive Bournemouth side 1-0. Eddie Howe, who may be secretly pleased that his Bournemouth side can now give greater focus to their man goal of avoiding relegation, continued to have his hand forced by his list of serious injuries. Gradel, Mings and Wilson all have bad knee injuries and will be lucky to be back before the end of the season. Elphick, meanwhile, is suffering from an ankle injury and is expected to be back in action in mid-December. Despite these injuries to four of his very best players, Howe’s side held their own at Anfield for the second time this season. The starting line-ups. Liverpool were somewhere in between a 4-2-3-1 and a 4-3-3, moving into a 4-3-2-1 at times during the second half.. Bournemouth used a 4-3-3 formation. The main tactical talking point in the mainstream media over the last two weeks has been pressing and gegenpressing, something Klopp’s Dortmund and Mainz sides were revered for. The British media are so obsessed with this because most senior football journalists and pundits only watch the Premier League therefore they have never seen pressing before. Klopp’s pressing is high intensity by Premier League standards however isn’t as energetic or chaotic as sides such as Schmidt’s Leverkusen or Sampaoli’s Chile. 1. Ball is played wide to Smith, he is pressed by Teixeira. 2. Smith recycles it back to Francis who isn’t pressed. 3. Francis plays it to Macdonald, who has his back to goal-he is pressed by Firmino. 4. As the ball is played back to Macdonald, Firmino sees the chance to press Francis while cover-shadowing Macdonald. 4. Teixeira stays tight to Smith and Origi blocks passes to Distin Macdonald simultaneously. Firmino presses Francis and forces a pass to Smith who can only find a dodgy chipped ball back to his goalkeeper who clears. Bournemouth’s build-up is stifled. 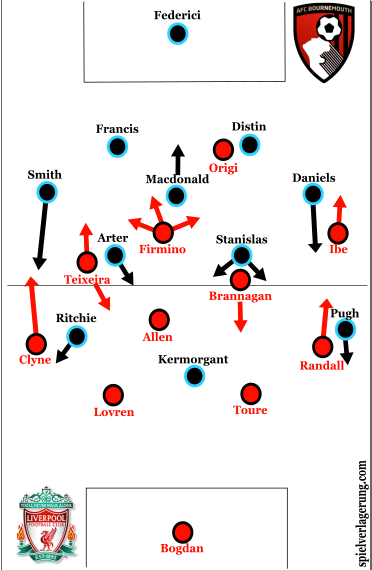 Liverpool were just as enthusiastic when gegenpressing however it lacked a bit of structure. Their spatially oriented gegenpressing system, similar to that of Klopp’s Dortmund worked well on several occasions although sometimes it wasn’t carried out by every player surrounding the ball and looked like players running around to win back the ball without any direction. Also, their possessional structure, which has to be perfect in order to make gegenpressing effective should they lose the ball will be worked on by Klopp in coming weeks. Below is an example of Liverpool’s spatially orientated gegenpressing in the second half of the match. Liverpool’s gegenpressing. Restricting the space around the ball-carrier as he receives a ball at chest-height. After a Liverpool through ball is cleared by a Bournemouth defender. The main criticism of Klopp’s short reign so far is the absence of free-scoring, exciting, attacking play he is associated with. Having said this, Liverpool were much improved in the final third than they were against Southampton or Tottenham. In early build-up, their centre-backs stay quite narrow and their fullbacks push high up, sometimes leaving the halfspaces completely empty. 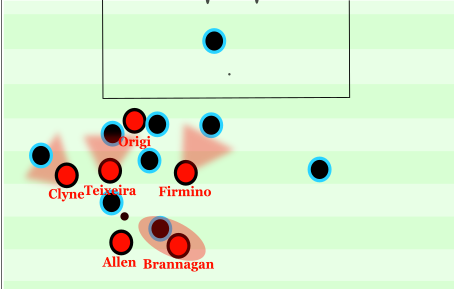 Teixeira, Allen, Brannagan or even Firmino took turns to drop into the space in front of the centre-backs and play short passes while looking for spaces in Bournemouth’s compact midfield five to thread a ball through. Using La salida lavolpiana as Rodgers often did would have helped occupy the halfspaces as well as given them more time to look for a long diagonal ball forward however this isn’t Klopp’s style, and besides, Liverpool didn’t have a player who can play these long high balls accurately. Liverpool placed their winger and full-back on the opposite side of the pitch to where the ball was on the touchline to stretch Bournemouth. This wasn’t too effective as Bournemouth were pretty disciplined defensively however did help open up spaces inside on a few occasions, especially in what some may call ‘zone 14’. This space in front of the opposition’s centre-backs is one of the most important on a football pitch, and Klopp’s selection of Firmino in a free central role meant that the most technically gifted player on the pitch was in said area. Firmino was a deserved man of the match, pressing brilliantly and causing havoc in between Bournemouth’s defensive and midfield lines. Teixeira also put in a notably good performance. Allen and Brannagan, who was replaced by Lucas in the second half, did a good job of containing Bournemouth in their own third. Bournemouth played with two deep defensive blocks when the ball was in the final third. Said Liverpool players held positions around 35-yards from goal where they could collect any clearances, stop counter-attacks, and pass the ball in space from side to side into pockets. Bournemouth-not your average English side. You would be forgiven for thinking a small club with an English manager that is promoted into the Premier League would play defensive, direct 4-4-2 football. However Bournemouth have continued to stick to their reputation of playing progressive football and are a true breath of fresh air in the Premier League. Tom Payne’s brilliant analysis of them illustrates this in detail. They were equally expansive as Liverpool were in possession. They played with lots of width, especially Pugh who hugged the left touchline for most of the match. Ritchie played more in the right halfspace while Smith provided attacking width from right-back. Klopp started with Clyne at left-back to cope with the threat that Ritchie poses while giving academy prospect Randall his debut at right-back. Pugh gave the youngster a tough night and most of Bournemouth’s threat came from giving Pugh the ball one-on-one with Randall. 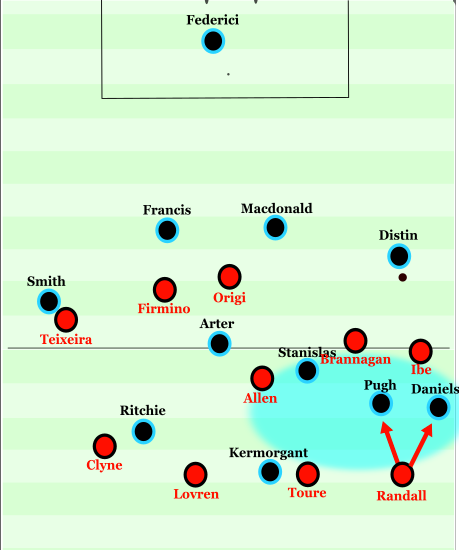 Liverpool maintained their horizontal compactness despite Bournemouth’s width although this did leave large spaces on either side of the field when the ball was being switched. This could have been exploited if Bournemouth had a player who can pick out long diagonal balls into these areas. Arter knows if he drops he will be followed by Firmino. Arter and Smith drop back towards the ball and open up a large space for Ritchie to move into and collect the ball. Ritchie was important in the halfspace throughout the match. In Tom’s analysis I linked earlier, he spoke of Eddie Howe implementing Juego de Posicion elements in his Bournemouth side. A few of these (La salida lavolpiana as you can see above; staggering; playing in between lines) were apparent in Wednesday’s match. Below is an example directly following the passage of play shown above. Stanislas, Pugh and Daniels move into the space between the lines. They have also overloaded the inexperienced Randall 2v1 should they receive the ball and are able to turn. Bournemouth were equally impressive in defence, restricting Liverpool’s creative talents to only a handful of chances. They used a 4-5-1 defensive shape against Liverpool’s early build up and didn’t press Liverpool’s back line, instead blocking passing lanes in their compact defensive shape. Their spatial control was fantastic. Kermorgant showed good energy pressing Liverpool’s centre-backs who aren’t very comfortable on the ball. This won’t be the most memorable win of Klopp’s Liverpool career but it has wet the appetite of Liverpool fans as well as those of us who are fans of forward-thinking tactical approaches and above all, exciting football. Early days indeed, but Jurgen Klopp could (and in my opinion will) revolutionise thinking within English football. I look forward to following his progress closely over coming months. Eddie Howe has had his work cut out with injuries to his most capable players but I believe Bournemouth will stay up and hope for English football’s sake that they do. Eddie Howe is eleven years younger than Klopp and despite having a few seasons as a coach under his belt already, is at the beginning of his managerial career. Despite this, I would not be surprised if in eleven years time Eddie Howe has achieved what Klopp has to date.